It's the moment we've been waiting for! 1.13 is finally out on Matecraft Survival. You can log in at matecraft.org and explore this amazing update for yourself! It has even come with a beautiful world reset to add the cool new ocean biomes. Our spawn is incomplete so please, don't mind our appearance! It will be added to as time goes on. Some features may not be fully functional or working properly. We are keeping an eye out for this so please be patient! We are excited for you to check things out. So log on and join us for a cool new adventure! - tpa requests in chat are now clickable, no more need to type /tpaccept, although you can if you want too. - Anvils will no longer tell you that an item is too expensive to repair. - Hold a compass, it's cool trust me. - Elytra flight comes with a built in speedometer in the Action Bar. - Totem of undying works from the inventory, no need to hold it. - The more people on the server that sleep, the faster the night goes! There's more but we'd be here forever listing them all. - You can NOT connect to a 1.13 server from a 1.12 server, or use 1.12 on a 1.13 server. It's that time many of you have been waiting for! This comes with a full world reset, and a bunch of new and returning features alike. 1.13 is a huge update and some things may not function as intended straight away. We will be keeping a close eye on things and making tweaks after the update as needed. - The Member+ quiz will not work. We will fix this asap. - Moving to a 1.13 server from a 1.12 one will disconnect you, but if you start in a 1.13 server [Survival or Creative] you can go back and forth without issue. - 1.12 Clients may not be able to connect, however this has not been extensively tested. - Teleporting to players across servers is non-functional. You have to join the server they're on, then send a /tpa request. We're working on bringing this back. - Some donor perks are broken, e.g /gadget. These are being fixed. MANY legacy donor features have broken and will not be receiving updates from the plugin developers. Creative will follow into 1.13 shortly after Survival so you can get to building with all the great new stuff added in this update! The old plot worlds will be removed when Creative is updated. This is your absolute last chance to move your builds into the new MiniPlots and MegaPlots worlds. - When creating an account passwords will now require uppercase letters, lowercase letters and at least one number. - You can now login with your email as well as your username. The site is currently undergoing a small face-lift to bring it up to speed with the rest of the server and we hope you like the new changes and features. 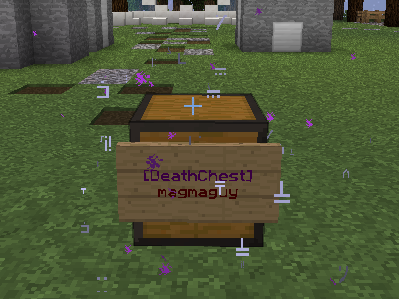 Coded by magmaguy and now called ResurrectionChests, these special containers collect your inventory when you die! To make one, simply place a chest or double chest, and place a sign on it with [DeathChest] on the 1st or 2nd line. There are also server shops set up at spawn for Iron, Gold, Diamonds and now Emeralds. Including the gambling shop with better rewards than before!